June 5th was the 21st anniversary of the Tiananmen Square protest from which this photograph was taken. In April 1989, thousands of Chinese citizens poured into Beijing’s Tiananmen Square, mourning the death of prodemocracy leader Hu Yaobang. Over the next seven weeks, the peaceful student demonstration swelled to more than 100,000 people. Late on June 4, the army entered the capital fortified with tanks and fired upon the unarmed protestors. No one knows how many protestors were killed or wounded. 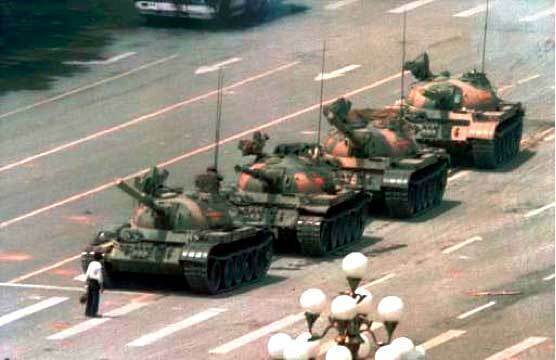 For many Westerners, this picture of a simple man —only known as the Tank Man—facing a row of army tanks is a lasting memory of the massacre at Tiananmen Square. But How do those Chinese who supported the pro democracy movement twenty years ago feel about the legacy of the Tiananmen Square? A year ago, when Sampsonia Way asked the writer Er Tai Gao to write about China twenty years after Tiananmen Square, he was more than willing to offer his reflection in Three Thoughts on Tiananmen Square. Living in China most of his life, Er Tai Gao was imprisoned after the Tiananmen Square protests. In 1992, he and his wife, painter Maya Gao, escaped to Hong Kong. In 2003, he became the first writer in exile at the first United States City of Refuge at the University of Nevada-Las Vegas. He is currently a fellow at the International Institute of Modern Letters at the University of Nevada. His memoir, In Search of My Homeland, is forthcoming from HarperCollins. Even a year after Er Tai Gao’s reflection on Tiananmen, the Chinese government is still trying to limit the flow of information concerning the incident. China has blocked the popular social networking tool Foursquare because too many people worldwide were logging in to the location and were leaving comments that the government deemed sensitive. Foursquare is a social media tool that accesses your current location to be shared with others also using the service. The Chinese government has long been known for its control over the internet and this is simply the latest manifestation of this control. China has censored Yahoo, Google, BBC News, Wikipedia, and many other website, blogs, and online tools that it deems inappropriate or threatening to the government’s legitimacy. This modern form of censorship is a reflection of the oppressive control the Chinese government continues to have over the country and its people. To what oppressive lengths do you think the Chinese government will go to cover up the Tiananmen Square massacre and continue to limit freedom of expression within its borders?